We still need to secure our water licences from Alberta Environment. 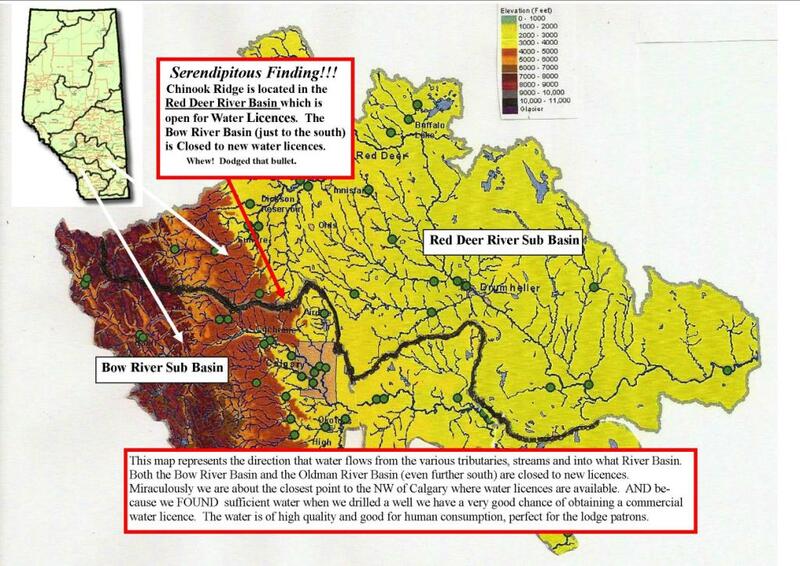 Fortunately we found we are located in the Red Deer River Basin where water licences are available. We know we have sufficient water for our needs (see write up below) but that is only part 1. Parts 2, 3 & 4 involve applications for Storm Water diversion, Waste Water Treatment and Irrigation. Eventhough we have been given RVC APPROVAL - we are still required to obtain a Water Use license based on the full capacity of the Lodge operating 365 days per year. The assumption of full capacity/full time is a requirement of Alberta Environment and the calculations for determining exactly how much water is needed is based on older fixtures and not the newer less wasteful fixtures. Those assumptions determine that we need a license for 48.8 cubic meters of water per day - AT FULL CAPACITY. More realistic estimates are in the range of 15 to 20 cubic meters per day (one cubic meter equals 220 gallons). That is what the Alberta Government Department of the Environment deems is required for licensing for a small Country Inn like ours. We found a well capable of producing 64.4 cubic meters of water per day as determined by a Q20 test, which measures flow and recovery over a 24 hour period. This well is in a 'confined aquifer' and is 'high quality ground water'. Monitoring wells were drilled as per the regulations perscribed by the Water Act. Alberta Environment will determine the frequency of monitoring and reporting of the well as conditions to the license. The water use is strictly for people in the lodge; feeding, bathing and cleaning. We do not anticipate ever being full to capacity 365 days per year so our water use will be much less than what the licensing process requires. Couple this with modern fixtures that conserve water and you can see the quantity used will be reduced even further. Rest assured we NEVER will use high quality groundwater for irrigating the golf course. All water for the golf course will come first from treated wastewater and second from retained stormwater. Even then our water reuse is minimized by directing moisture right at the root zones. Moisture is not sprayed overground and subject to either evaporation or run-off. The result is a very practical reuse of water still keeping water reuse to a minimum. Hopefully the video and 4 artilces provided here will give readers a good overview of how and where water is found as well as how it never really leaves the earth. We just borrow it.